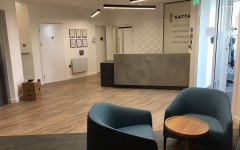 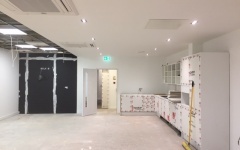 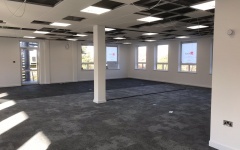 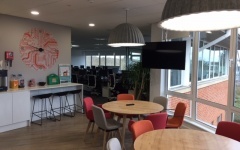 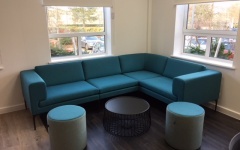 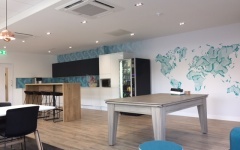 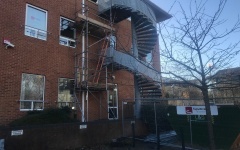 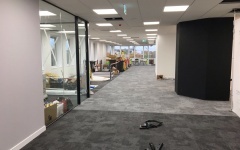 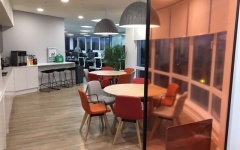 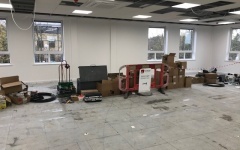 Take a look through our project timeline of the Matchtech office in Fareham! 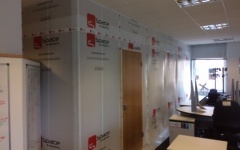 Temporary partitions to separate the 1st and 2nd phase. 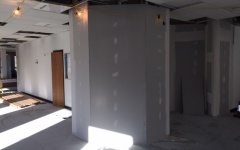 Temporary partitions are up to separate the second floor. 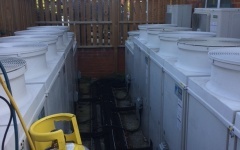 De-gas of existing condensers ready to strip out the first phase AC units. 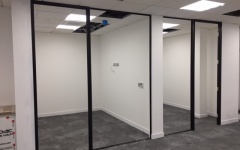 Partition and bulkhead created for new tea-point. 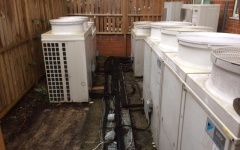 Delivery of new AC cassettes and the old ones stripped out. 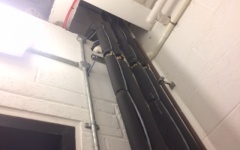 New pipework is ran for the new AC systems from ground floor compound to first and second floors. 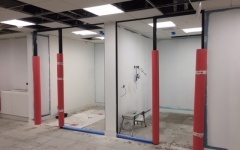 Taping and Jointing new partitions. 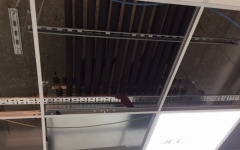 New BC box installed for the new AC system on 2nd floor. 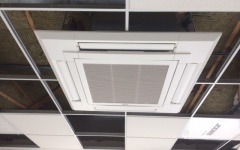 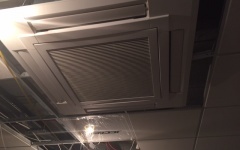 New AC cassettes have been installed. 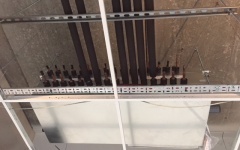 New LED light panels being installed into grid. 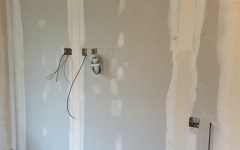 First fix data is underway. 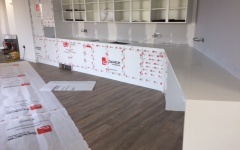 Tea Point is being installed. 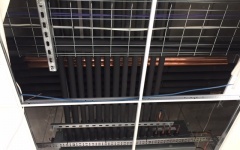 Piping for the first phase AC units is installed from the BC box. 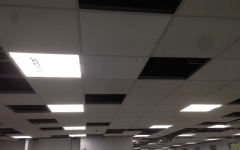 New LED panels are up. 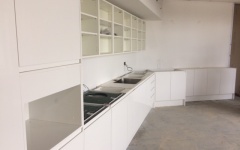 Tea Point is installed, just waiting for the special order wall unit doors and quartz stone worktop. 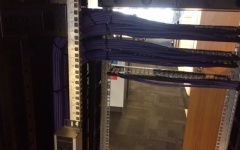 Data second fixed into new cab on 2nd floor, with fibre and copper links to ground floor comms room. 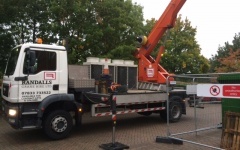 The crane is here to lift out the old condensers and lift in the new. 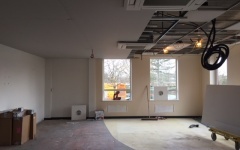 The second floor condensers are gone. 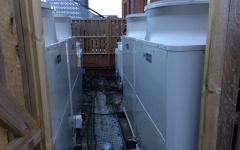 New condensers are now in place! 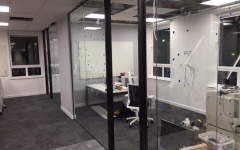 Black glazing track is installed for glass screen to tea-point and new round lights are installed. 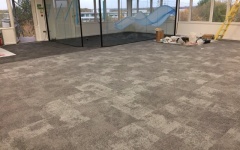 Carpet is down with power and data ready for the desk install. 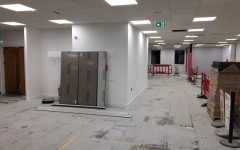 First phase is ready to hand over. 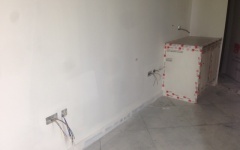 Tpoint for the first phase is done! 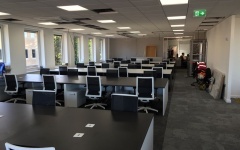 Desks and furniture are in! 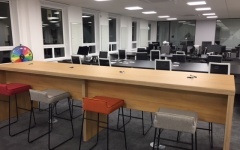 Desks and furniture is in! 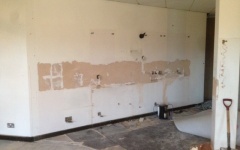 Demo to gents toilet and opening made for extension. 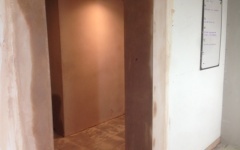 Plastering to toilets and new opening. 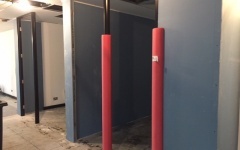 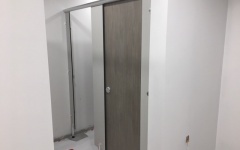 New partitions to extended toilets. 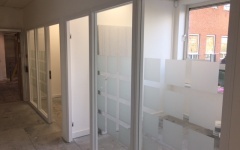 Extended toilet partitions out into the office space. 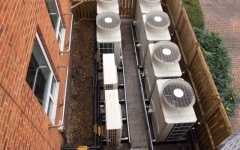 Pipework runs for new AC cassettes. 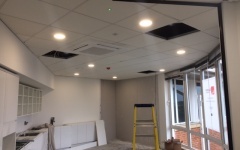 New AC cassettes and lights going in. 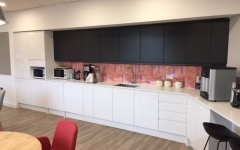 New doors fitted to the tea point wall units in the dark grey matte. 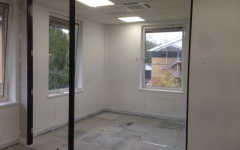 New partitions to create office and meeting room. 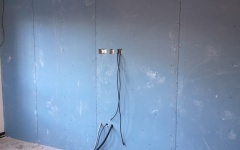 First fix electrics in partition for TV positions. 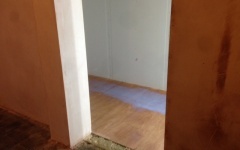 Floor to extended toilet is plied and primed ready for latex screed. 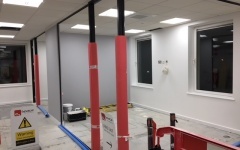 Glazing track and door frames installed. 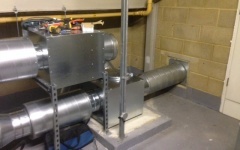 New fan units installed for toilet extraction in plant room. 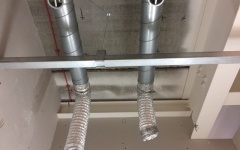 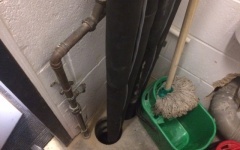 Ducting work installed in male toilets for extraction system. 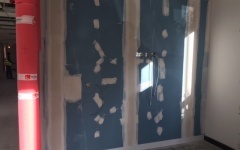 Tape & Jointing to new partitions. 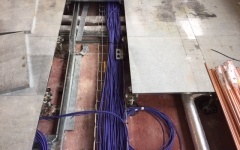 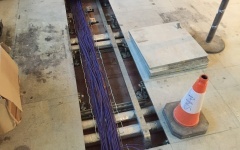 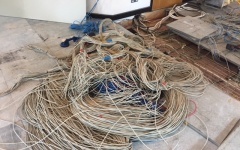 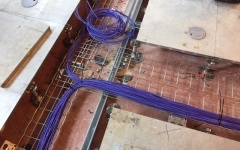 Data cables been pulled into position in floor void. 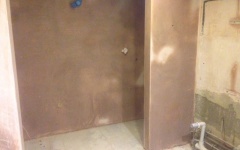 Toilet wall is lined out and 1st fix plumbing complete for new sinks. 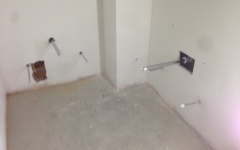 1st fix plumbing complete in the cleaners cupboard ready for lagging. 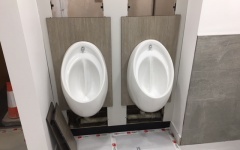 Extended toilets waste and feeds 1st fixed. 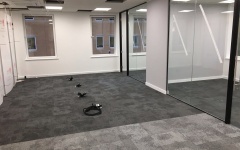 Glazing Track is fully complete ready for glass survey. 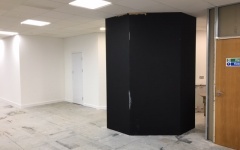 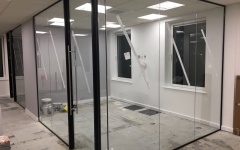 Existing office glazing track is sprayed black to match the new stuff. 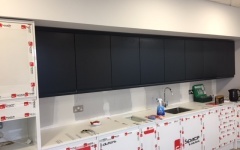 Storage unit & worktop installed to reprographics area. 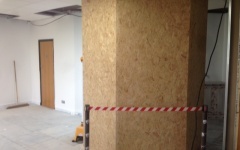 OSB Wall around comms room is installed ready for decoration. 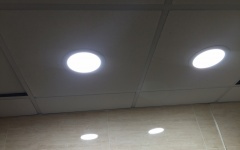 New ceiling installed in toilets with new lighting and extraction. 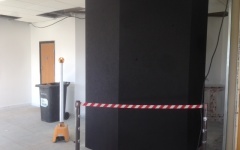 The OSB wall is painted black. 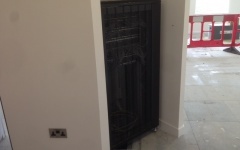 The comms cabinet is moving to its new housing. 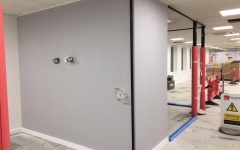 Grey feature wall to divide the new office and meeting room. 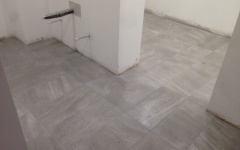 New floor tiles installed in the gents toilets. 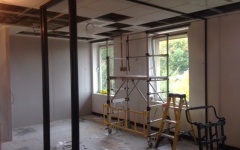 The ceilings are tied back in and waiting for final coats to the OSB wall. 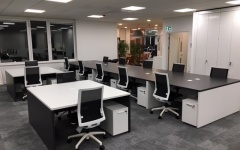 New office and meeting room. 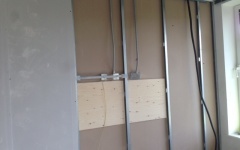 The new duct paneling is being installed. 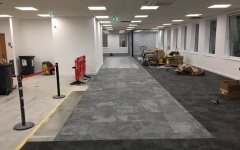 A look down site with decorations nearly complete and nearly ready to start flooring. 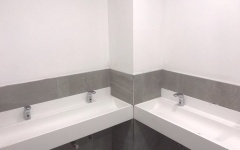 New trough sinks installed ready for wall tiling. 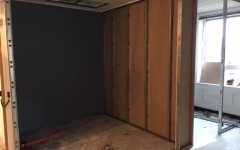 Duct panel and cubicle installed complete. 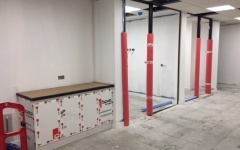 Duct panel and cubicle install complete. 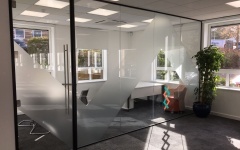 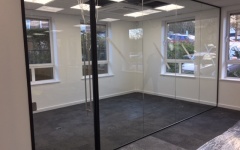 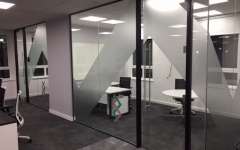 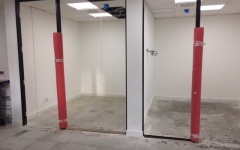 Glass partitions and doors installed to new office and meeting room. 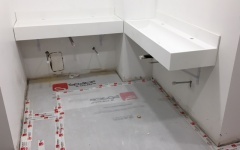 Wall tiling complete and second fix plumbing underway to trough sinks. 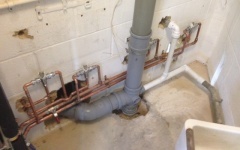 Second fix plumbing to the new toilets is in progress. 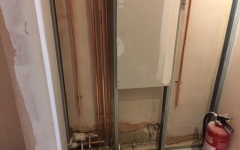 Second fix plumbing to new toilets in progress. 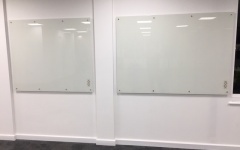 Glass boards are installed to phase 2. 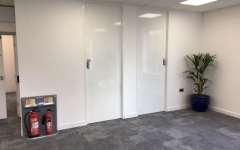 New white gloss laminate doors fitted to floor entrance and toilets. 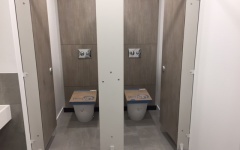 Toilets nearly complete, just in need of final clean and mastic. 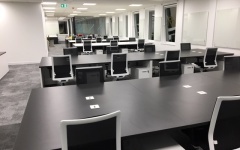 The desks have been installed. 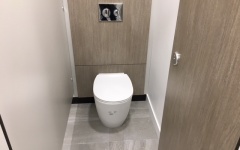 Final clean and mastic to toilets now ready to use! 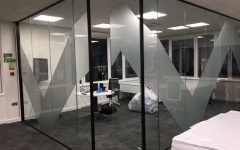 New manifestation to MD's office. 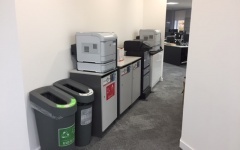 Client has moved in the IT for staff relocation. 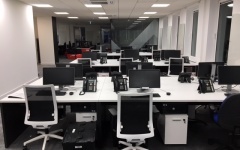 Client has moved in the IT for staff relocations. 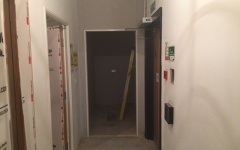 Handover of phase 2 and the 2nd floor. 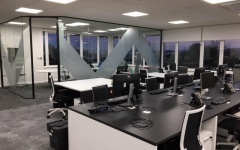 MD's office is handed over. 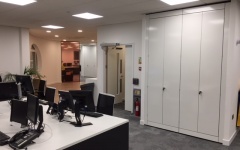 MD's office has been handed over. 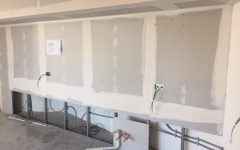 Ready for the next phase, 1st floor. 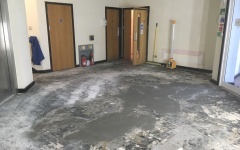 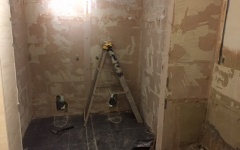 Demo underway in ladies toilet 1st floor. 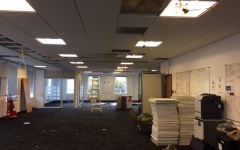 Slowly clearing the remainders of 1st floor clutter and setting up temporary lighting. 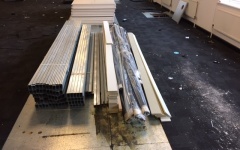 Delivery of partitioning material for 1st floor. 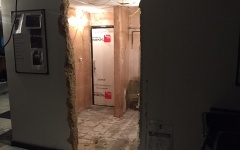 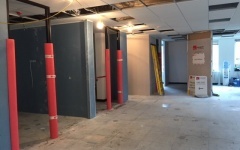 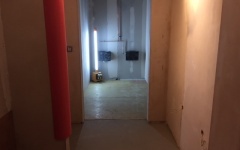 The opening has been made to extend the first floor female toilets, ready for plastering. 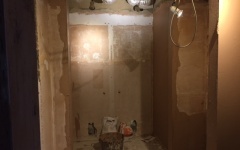 The old toilet walls are plastered. 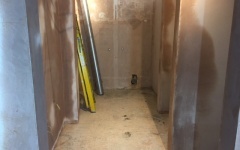 Lining out to create the extended part of the toilet is underway. 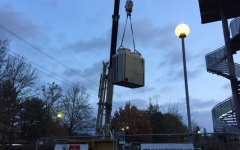 Crane lift for the new condensers for first floor AC system. 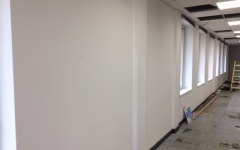 Lining out to the reprographics area wall. 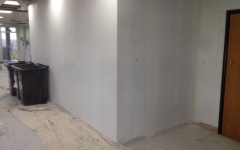 Extended toilet walls are boarded up. 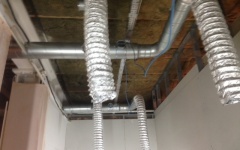 First fix ductwork to new ladies toilet. 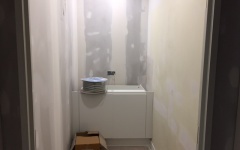 Toilet wall lined out to conceal pipework underneath 'floating trough sink'. 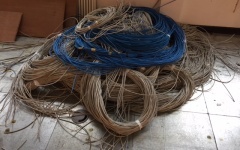 Old data cabling being stripped out. 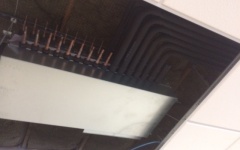 New teapoint extract is first fixed. 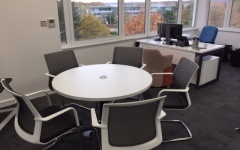 New meeting room and office are created and ready for boarding. 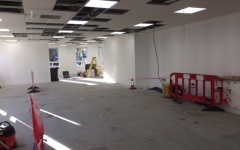 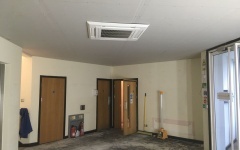 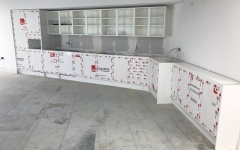 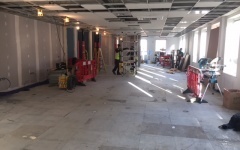 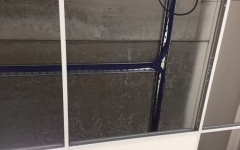 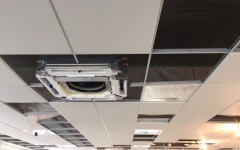 New cassettes and light tiles are located into the ceiling, ready for pipework and connections. 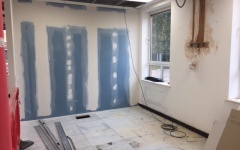 Tape and jointing underway to new partitions. 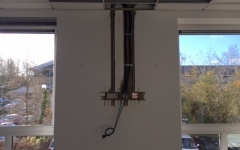 Jointing and first fix electrics in meeting room. 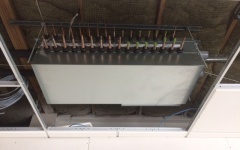 New BC Controller for first floor AC system is installed and being piped up. 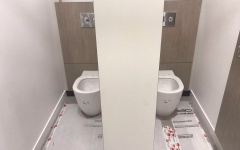 Jointing to the extended toilet. 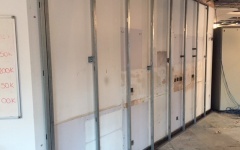 First Fix electrics and plumbing installed to tea-point wall. 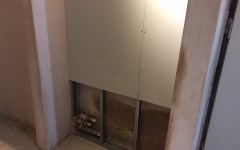 First fix plumbing to ladies toilet for new sinks. 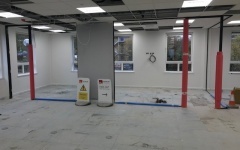 Chasing and first fix AV power in office wall. 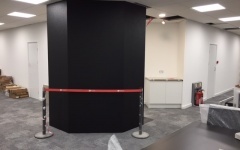 Reprographics area and comms wall jointed. 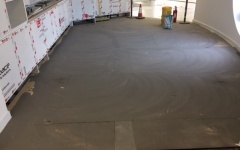 Floor is plied and screeded in the extended ladies. 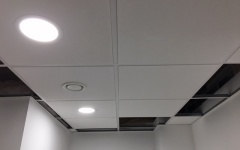 New ceiling grid is installed in the ladies. 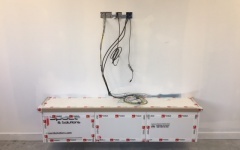 Tea-Point is delivered ready for install. 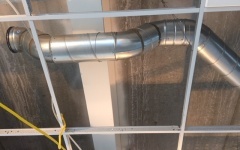 AC pipework is nearly complete internally. 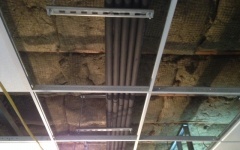 First fix data and aerial to new tray in ceiling void. 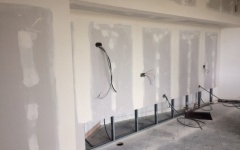 Jointing is complete all ready for decorations to begin. 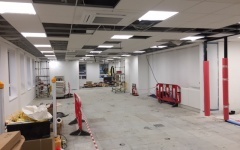 New lighting is on and the new cassettes are installed into the ceiling. 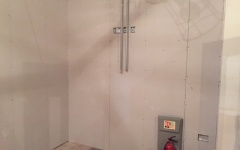 Comms room wall and storage unit. 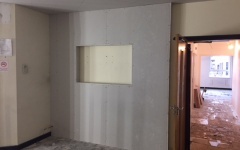 Decorations to basebuild walls are underway! 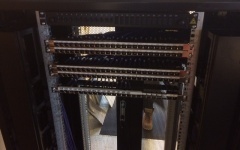 T point has been installed and is protected! 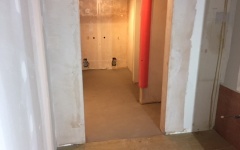 Flooring has been tiled and protected. 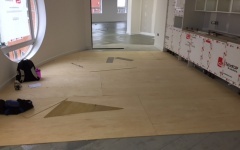 Ply being laid on the tea-point floor. 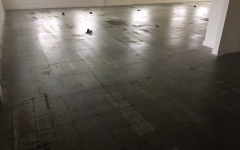 Floor cleared and tackified ready for carpet. 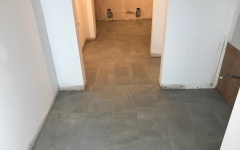 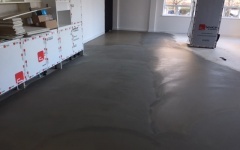 Latex screed to tea-point floor. 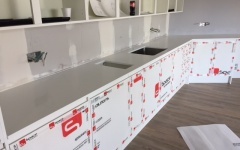 New stone worktop is installed to tea-points. 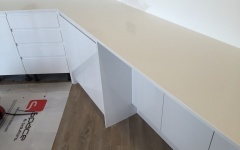 New stone worktop has been installed into the teapoints. 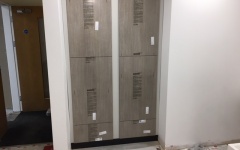 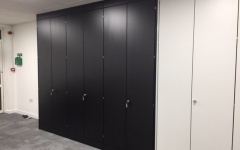 The dark grey matt finish doors are installed to the wall units. 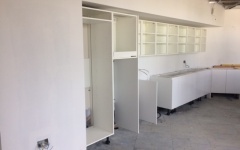 Furniture install is well underway. 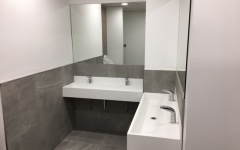 Plumbing second fix nearly complete in the toilets and mirrors have been installed. 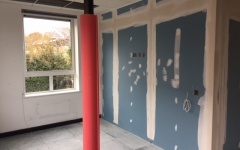 Final decorations are being carried out, bragging wall has it its top coat. 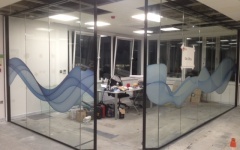 Glass boards and blinds have been installed. 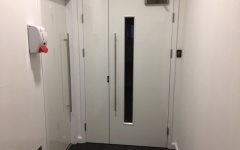 New toilet door signage installed. 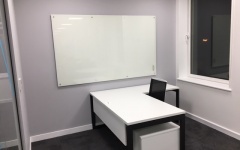 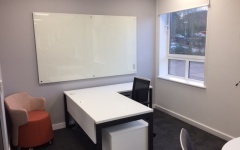 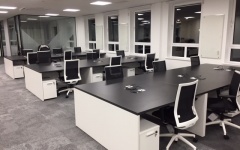 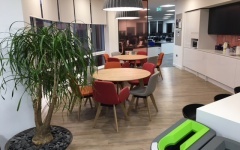 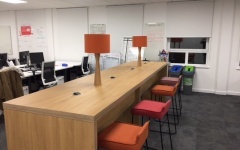 New desking install complete and ready for occupation. 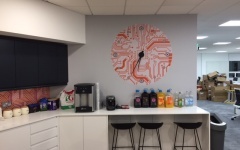 Artwork to clock wall in tea-point. 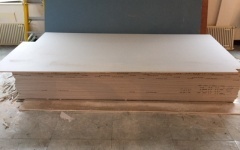 Project bench table and stools are installed. 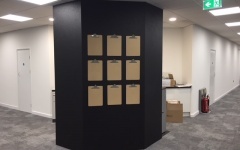 Clipboards are hung on the bragging wall. 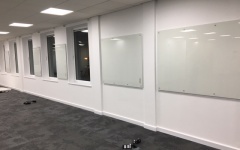 Manifestation installed to the office and meeting room. 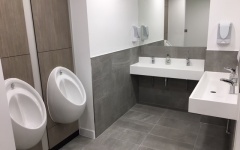 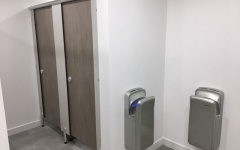 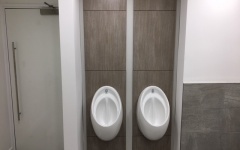 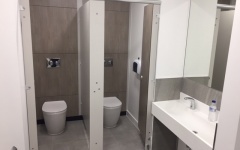 New extended ladies toilets are complete. 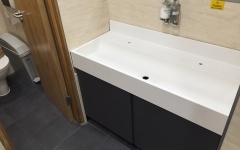 New vanity unit and trough sink is complete in 1st floor gents. 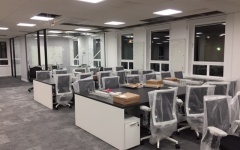 Office furniture has been installed. 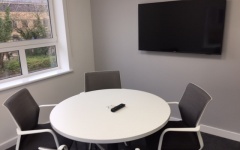 One of the meeting rooms is coming together nicely. 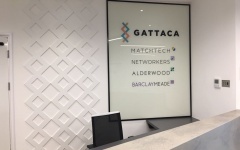 Meeting room signage is up! 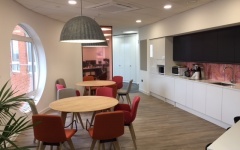 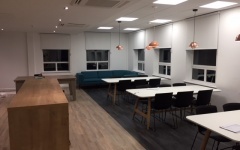 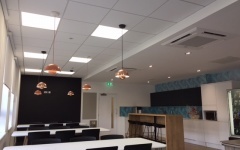 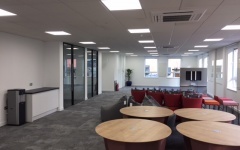 Tea point furniture and pendant lights installed all ready to handover. 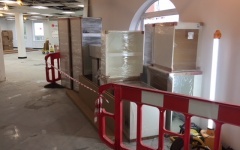 Plasterboard is delivered for final phase on ground floor. 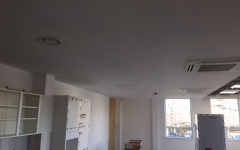 Existing lighting has been removed. 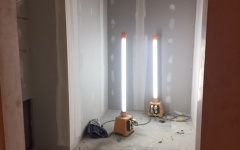 Temporary lighting is put up until the new lights are installed. 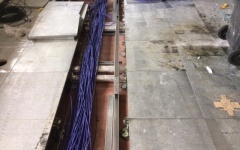 Old data cabling is stripped out. 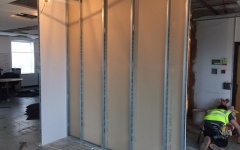 New partitions are going up. 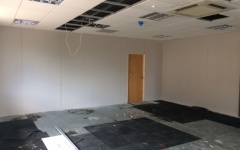 New meeting rooms are formed. 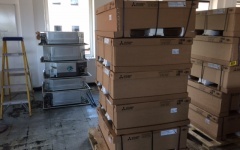 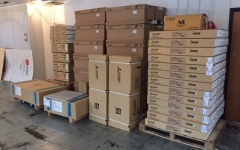 New AC cassettes are delivered to site ready for install. 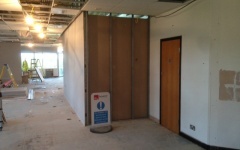 Meeting rooms and store rooms are all built. 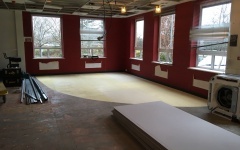 Existing flooring to tea-point is stripped up and ply laid ready for new vinyl. 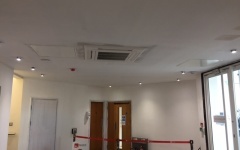 The new MF ceiling is installed in the reception. 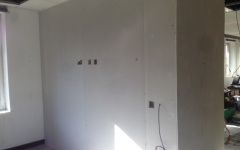 Meeting room wall is lined with first fix electrics and AV in place. 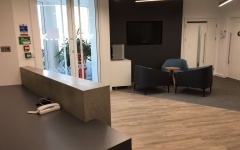 The TV recess is created in the reception. 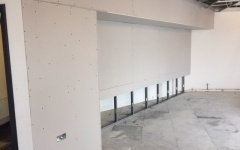 Tea-Point TV wall lined our ready for OSB. 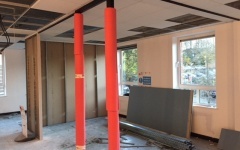 Partitions to create the post room and separate the tea-point. 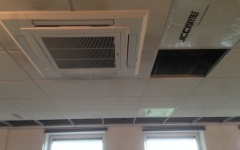 New AC cassettes are going up. 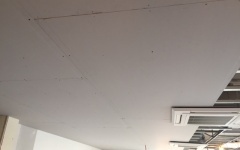 New MF ceiling being installed in the tea-point. 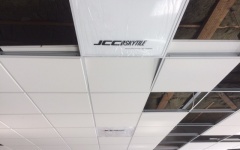 New AC cassette's and light are in place in the ceiling. 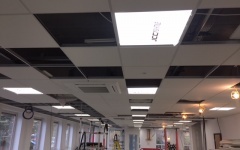 Lighting installed in the post room. 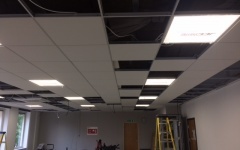 Tea-Point MF ceiling and bulkhead is now complete. 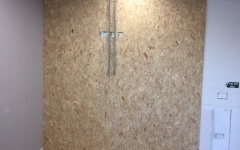 OSB is fitted to the tea point tv wall. 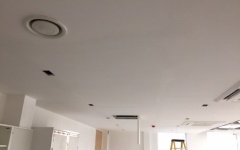 New spot lights are cut into the reception ceiling. 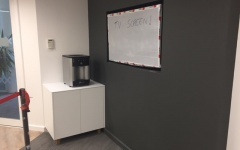 T&J to reception TV recess. 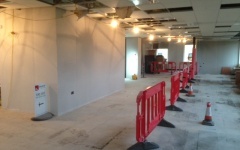 A view of the site! 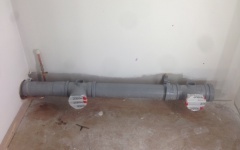 New pipework being installed for AC system. 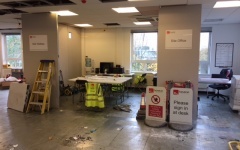 Site progressing and decorations underway. 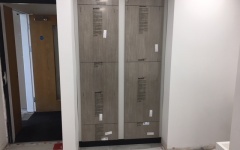 Post room storage unit being installed. 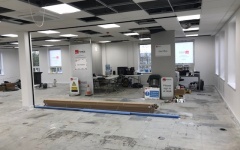 Print area is being installed. 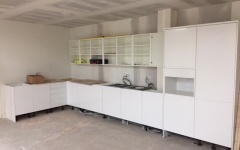 Tea-point unit install complete ready for worktop and wall unit doors. 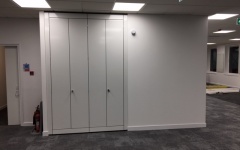 Floating storage unit in the meeting room. 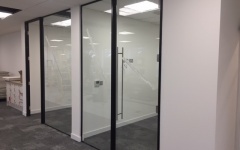 Existing partitioning system is sprayed to freshen it up. 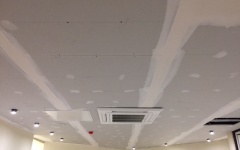 Decorations to the new MF ceiling in the tea-point. 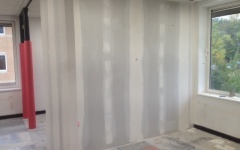 First coat is going in! 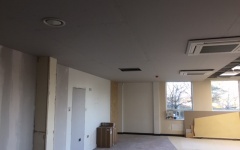 New TVs are fitted to first and second floors. 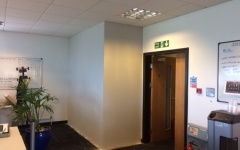 New TV fitted to 2nd floor tea-point. 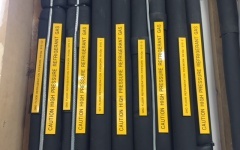 The new AC system is gassed up and pressure tested, pipework being labelled. 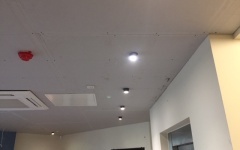 New lighting is cut out in the MF ceiling. 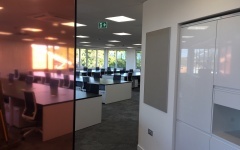 the two new meeting rooms. 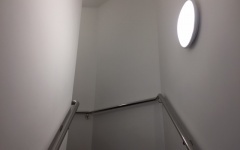 Decorations to the stairwells are complete and new LED lighting. 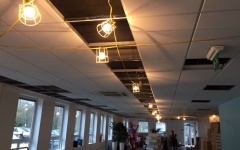 New lights are on in the tea point! 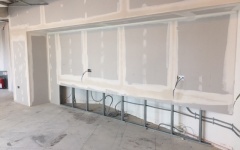 Tea point is coming along nicely. 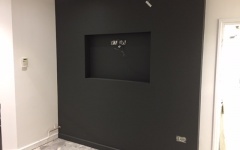 TV wall to reception is decorated. 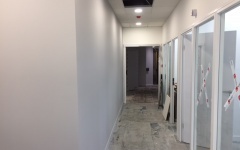 Office entrance hallway is decorated. 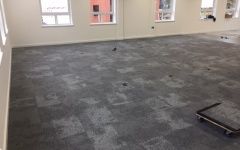 New carpet is being laid to the main office. 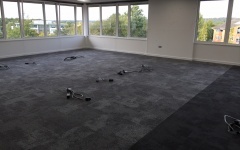 Carpet into the new meeting rooms. 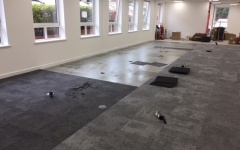 Tea-Point floor prepwork done ready for the vinyl! 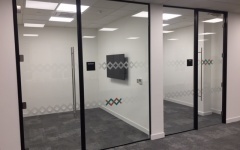 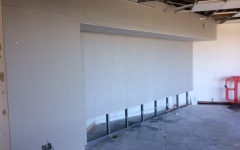 Glazing install to meeting rooms. 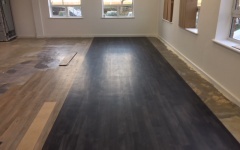 Vinyl flooring being laid to tea-point. 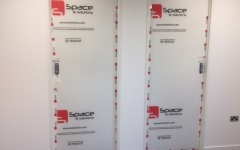 Door install complete and digi locks fitted to store room doors. 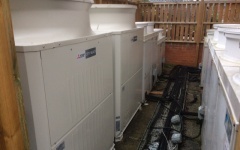 AC Compound is tidied up with all new condensers now on place. 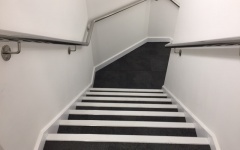 New carpet and nosing's to stairwell. 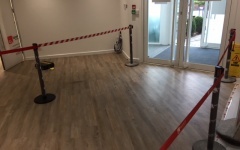 New vinyl flooring complete to reception. 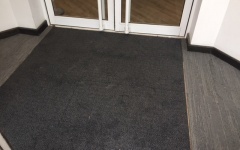 New carpet and barrier mat is laid to entrance lobby. 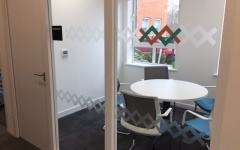 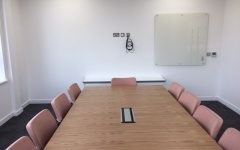 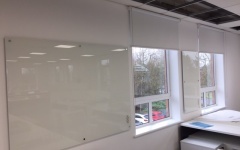 Manifestation is installed onto the meeting rooms. 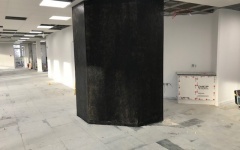 New black storewall is installed. 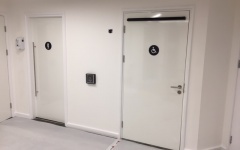 Signage to the reception toilet doors. 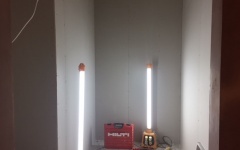 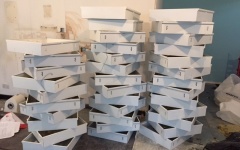 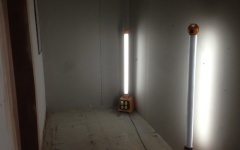 Desk lamps are fitted to the project benches. 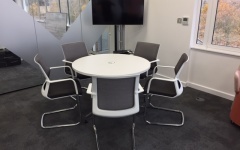 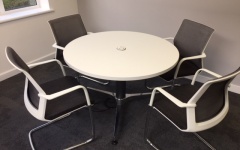 New furniture installed into the boardroom. 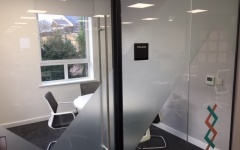 Manifestation, signage and furniture to the interview rooms. 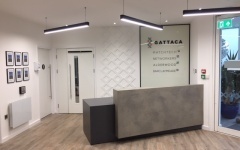 New reception desk installed with hanging pendants. 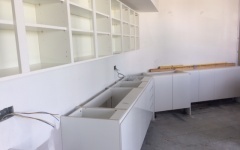 Storage unit and water cooler installed and hanging pendants. 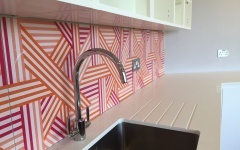 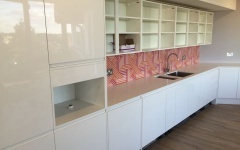 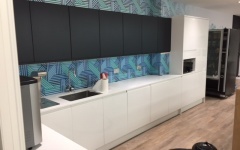 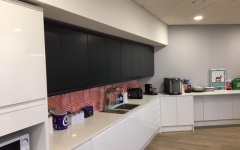 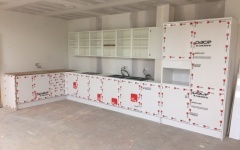 Splashback, artwork and special doors fitted to teapoint. 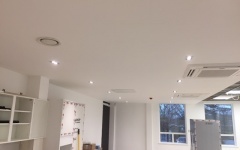 Pendant lights have been fitted. 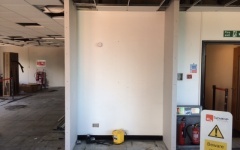 Print area ready for decorations. 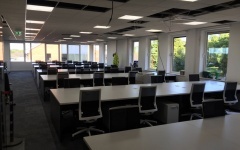 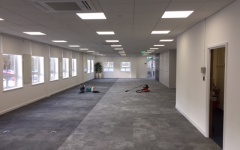 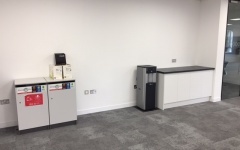 Ground Floor at handover, ready for relocation's. 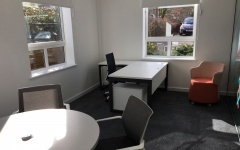 Office on ground floor at handover. 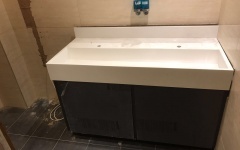 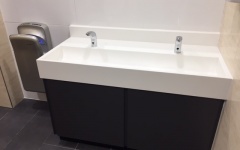 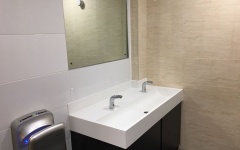 New vanity units and sink in gents.